Mitsubishi Electric delivers innovative, open, flexible and reliable VFD solutions geared to the special needs of individual markets and customers. 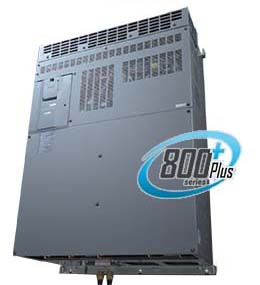 The new FR-A800 PLUS series inverters take the outstanding performance and functionality of the standard FR-A800 series VFD combined with special firmware to make a drive dedicated to specific industries and applications such as Cranes, Winding/Unwinding applications and Mining. The FR-A800-CRN variable frequency drives, with built-in features such as "vibration suppression control", "torque build-up in the shortest possible time" or "load-based speed control" functions are specifically designed for Crane and Hoist applications. The FR-A800-CRN series VFD enables cycle time optimization, resulting in increased productivity, smooth operations and overall user safety. Roll to Roll means the control technology for continuous roll-to-roll processing of a web (sheet of a paper, film, or other material) from the unwinding roll to the winding roll. The FR-A800-R2R inverter with built-in dedicated functions like automatic winding diameter calculation, automatic dancer speed control, and sensor-less torque control for perfect tension feedback all of which deliver stable and precise control in roll-to-roll applications. The FR-A800-R2R inverter is the perfect choice in a wide variety of systems with various dedicated wind/unwind functions. 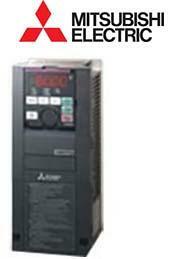 The A800-LC series VFD is well suited for locations when air-cooling would be difficult and extremely expensive or when control system space is a premium. Coolant is used for cooling the inside of the inverter. Liquid cooling enables new applications in the environments where heat is difficult to be dissipated. A smaller enclosure can be used since the quantity of the heat dissipated in the enclosure is reduced. A dedicated monitoring sensor (flow switch) is attached at the inlet of coolant to send a signal to the inverter. Equipped with a built-in EMC filter (capacitive filter) and a common mode choke, the FR-A800-LC are suitable for various mining and heavy industry applications.